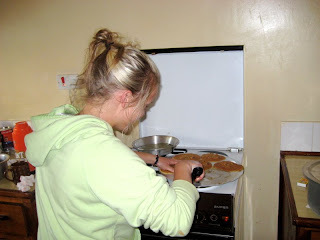 We have found so many things to be different here in Kenya: cooking is a big one. Here's the chicken Daina made for dinner last week. We asked Ayub to get it for us and found it that night in our refrigerator. 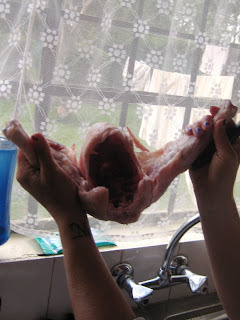 Daina had to cut the neck off, pull out all of the bones and each of the organs, clean and prep it. I had to sit in the living room while all of this was going on because I was so grossed out. (Knowing that as long as I didn't watch this happen, I could still eat it for dinner...and it was delicious) Megan and Caroline have become our house bakers. They have now made oatmeal chocolate chip cookies three times...and some really delicious frosting for store-bought cookies. There's been talk of caramel corn in the next few days, I'll let you know how that turns out. Carol and Megan have tickets to fly home on September 11th. Please be praying that they stay with us...they're such fun additions to the house...and to our diets! Had Gina been there she would have croaked right there in the living room! I don't know...I think I'd starve!!! 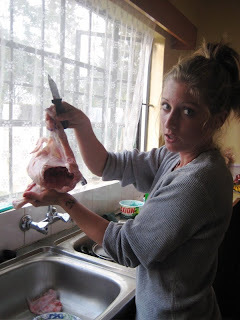 Allison, I just want you to know that I really enjoy reading your Kenya Blogg! some of us will never get the chance or have the "guts" to get out of our comfort zone and experience "real" life....Thanks for sharing and keep doing good for all of mankind! :)You are making a difference!